The Pink Power 12 Volt Cordless Drill and Driver Kit was specially crafted to have more power and precision in a compact size. Brand new for 2017, this model has a host of new features that will make any home improvement task easy to accomplish. Our drill features a built-in battery gauge making it easy to see how much power you have left. It also showcases an LED light that automatically turns on when the trigger is held to help make it easier to work in dark and confined workspaces (such as cabinets, when assembling furniture or when in poorly lit areas). We have also included a 13-piece bit and driver set made of high-speed steel (HSS). Weighing in at just over two pounds with the battery, this tool is light enough to use for long periods of time without wearing you out. The 18 torque settings help give you the accuracy needed for any application whether its to hang drywall or just hang pictures. Every Pink Power Cordless Drill Set comes with a One-Year Warranty. 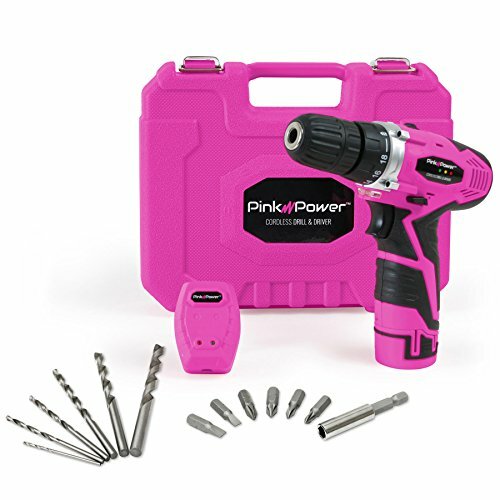 Pink tool kit includes: pink power drill, tool case, charger, drill bit set, one 12V Lithium-Ion battery & a one-year warranty. Compact cordless drill driver includes a built in LED light that activates when triggering the drill making it easier to work in tight or dark spaces. The built-in battery power gauge shows how much power you have left. The cordless, battery powered design allows you to work anywhere. Weighs just over 2lbs with the battery making it easy for anyone to use. The perfect addition to any hand tool set. Offers keyless chuck with 18+1 torque settings and two speed settings. If you have any questions about this product by Pink Power, contact us by completing and submitting the form below. If you are looking for a specif part number, please include it with your message.